The changing rock formations of Hopewell Rocks at low tide along the coastal shores of Hopewell Rocks Provincial Park in New Brunswick, Canada. 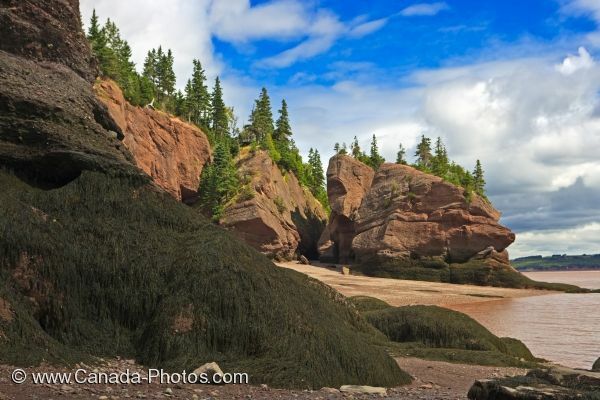 As the tide recedes at Shepody Bay in Hopewell Rocks Provincial Park in New Brunswick, Canada, the beach and rock formations of the Hopewell Rocks are easy to access. At high tide, the beach in this area of Hopewell Rocks Provincial Park is closed as the water comes in fairly quickly and could trap people along the coastal shores. These unique rock formations have been created over the years by the water and the tides which has sculpted them into fascinating shapes. Originally formed from mud, pebbles and rocks all compressed together, the storms, tides, rain and wind are continuously changing these flowerpot rock formations. As years pass, these rocks may end up looking entirely different from what tourists see today. Hopewell Rocks, Hopewell Cape, Shepody Bay, Chignecto Bay, Bay of Fundy, Albert, Highway 114, Fundy Coastal Drive, New Brunswick, Canada. Picture of the rock formations of the Hopewell Rocks at low tide in Hopewell Rocks Provincial Park in New Brunswick, Canada.